As I approach the mid-century mark in less fingers than I can count on one hand (Ay, Dios Mio! ), the questions that have been haunting me the last few years are ringing louder in my head by each day: Should I eat less meat? Should I touch factory farmed meat and poultry or buy more organic? Should I go vegetarian or perhaps vegan? How about dairy products and egg? And fried foods? Sugar? Wow, can I eat anything at all besides raw organic vegetables? Are my gastronomic adventures going to be haunted by the ghost of guilt? How long can I continue blogging before making this a vegetarian site? These questions are picking up momentum and soon turning into a vortex in my conscience as we approach summer, a time when I cannot resist one of my seasonal vices (oops, the ugly head of guilt again) – the hamburger. There is something irresistible about a grilled beef patty sandwiched by two pieces of fluffy buns filled with the various not-so-subtle accoutrements that satisfy the indulgent craving for sweet, salty, sour, and savory (hmmm, all begin with S’s like Sins). Slices of crisp lettuce and juicy ripe tomatoes are the saving grace and penance that delude us to think that the beef patty ain’t that thick nor so bad after all. Like a Catholic trying to overcome Sunday guilt, I visit my Amish butcher to purchase antibiotic and hormone-free ground beef to make the patties for my cookouts. But what do you do when the craving strikes while out in public? McDonald’s, Burger King, Wendy’s, Sonic, Five Guys – when Hell freezes over!! 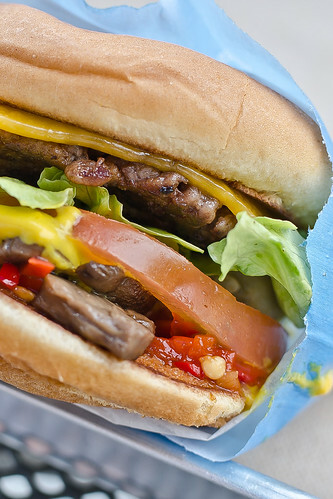 Burgers: The beef patties are made from 100% organic, grass-fed and free-range meat. They are smaller than your usual patty, perhaps around 1/4 pound, and they tasted not overly “beefy” due to the lower fat content, a purer taste than the usual burger. The slice of cheese had a slightly granular texture for being aged cheddar cut from the block, and not the insipid processed version. The burgers come in double-patties, single patty with cheese, one patty hamburger, and one patty plus one veggie (“Half The Guilt Burger” – penance?). The toppings are the usual that one would find anywhere, but specials are offered on any given day, like sautéed mushrooms and bacon (no lesser guilt here) on one visit. I found the pickles to be brightly and less metallic, perhaps due to local sourcing and not being factory produced. The Hot Pepper Relish packed some heat, and although I love piquancy, it did overwhelm the subtleties in the burger (a subtle burger, you ask?). 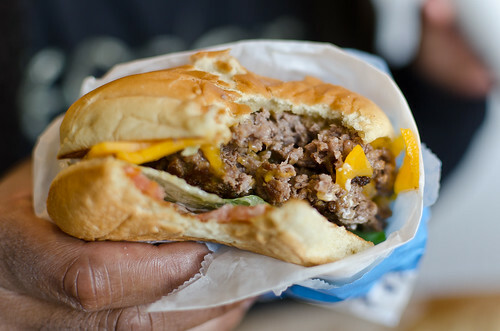 The burgers may not be as humongous and “meaty” as other places but they make up in quality and in taste. Less meat – check. Organic grass-fed free range meat – check. 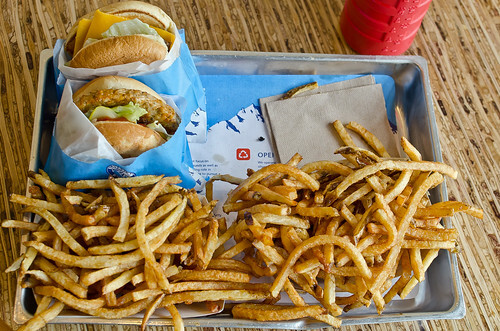 Vegetarian offerings: There are two vegetarian burgers that are offered here. 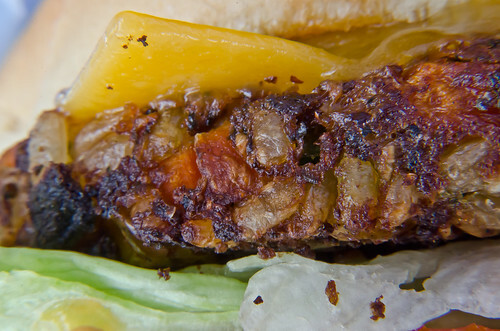 Veggie Burger #1 is a patty that is made with pureed vegetables and cheese. For me it was OK, since the patty did not have any specific taste from the processing that made it a bit nondescript – maybe it is more palatable for those who are not the usual vegetarians. Veggie Burger #2 comes with a savory vegan patty. You can see and taste the individual bits of corn, carrots, peas, and rice. This was more to my liking and it tasted more substantial and flavorful. Yummy! Grilled Cheese Sandwich is offered here with that 6-month aged Cheddar for those looking for an alternative to meat or vegetable. Side and Main Salads are also offered but they looked rather pedestrian to me – at least, these are good substitutes for fries. Vegetarian and Vegan offerings – check, check. French Fries: The shoes string fries are cut from whole potatoes judging from the skin left on. However, they are more limp than the fries found in other burger places. Reason why? They are cooked in 100% olive oil, and since it has a lower smoking point, they cannot be made very crisp due to the lower cooking temperature. However, I don’t mind not-so-crisp fries in lieu of whole unprocessed potato bits cooked in healthier oil. On one visit, I thought they were slightly oversalted, but it was perfectly fine the next visit. Fried foods, if only in healthy oil – check. Desserts: We tried the Small Cookies which consisted of 3 chocolate chip, pecan, and oatmeal treats made with organic butter and milk. They were pretty small (photo – “objects are smaller than they appear in macro shots”) but they were sinfully good with a rich buttery taste. Like all items on the menu, there is a calorie count with these – nearly 300 calories for all three. These cookies also come in a larger version. If the amount of calories is a bit intimidating, there are also Mandarin Oranges as a sweet alternative. Sugar – occasional check; sweet fruit – check. 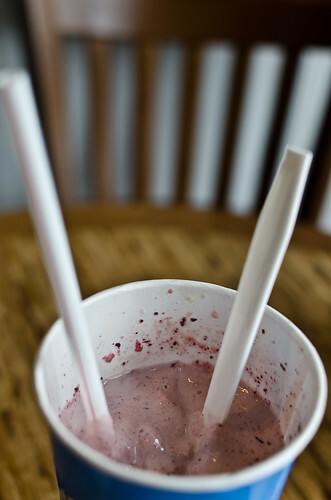 Drinks: The milk shakes are made with organic milk, organic ice-cream, and “real berries and strawberries” (as listed on the menu). Bits of fruit are speckled on the cup which confirms the use of “real” fruit, which distinguishes it from the use of fruit syrups found in other places. 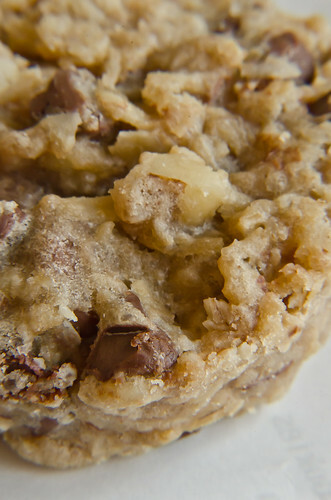 However, the over 700 caloric count is pretty daunting and a reminder that this should not be a frequent treat. The eatery also offers bottled drinks that are low in sugar, no High Fructose Corn Syrup, and are made with healthy green tea and real lemonade. Milk shake – infrequent check. Healthy bottled drinks – check. Ambience: The philosophy of this new direction is not confined to just the food and drinks only. The napkins are made from 100% recycled paper, the light bulbs are highly efficient, the floor are made from sustainable bamboo, the tabletops are compressed sorghum, and the urinal is waterless (too much information here?). The used olive oil is also recycled to make biofuel. All these elements add to the feel-good energy when you step into this place. Even the cook staff step out from behind the counter to bring your order to the table (using names and not numbers) and to check on the customer. Low polluting sustainable caring environment – check. 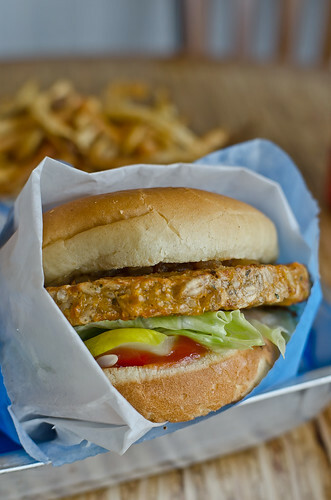 Elevation Burger is offering something quite unique and revolutionary in the fast-food world. But it is about time that we are challenged beyond our old habits and energies in order to be elevated with a new consciousness and direction, much like our President today announcing his support for equal marriage rights. Putting philosophy and ethics aside, its offerings are nearly as good, or even better (mos def ethically), as the usual versions that we are accustomed and conditioned to. Currently, they are available in only 10 states including the MVA area. But judging by the crowd on my last visit, I’m sure this chain will take off in other states soon, and rightfully so. 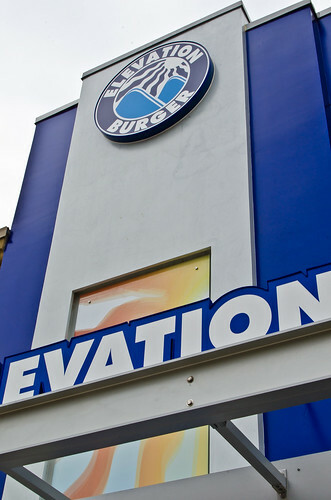 With many branches in the area, my future visits to Elevation Burger might bring me closer to Burger Heaven/Nirvana.